Even in a small bathroom where floor space is at a premium, you can usually find some open wall space — above the toilet, behind the bathroom mirror or elsewhere in the room. Think higher instead of bigger, and consider adding a wall-mounted cabinet that can tuck away toiletries and give you organized storage right in the room. There are wall cabinets in all kinds of styles today, so it’s easy to find one that fits your preferences and works in your space. Plus, you can add cabinets or shelving in such a way to enhance the room’s visual interest. One of the best ways to create space where it’s lacking is to work your storage to fit your space. Rather than trying to accommodate your bathroom to bins or baskets, for example, why not create a custom shelving unit that’s measured to your open areas? You can make it exactly the length of your room, exactly the depth that is comfortable, and so on. You could build sliding shelves into your vanity so that storage becomes more accessible and organized, or you might add a shelf above the bathroom door to make the most of your space. This option is especially smart in an irregularly shaped bathroom where finding storage space or solutions to accommodate it can be tricky. Towels are a bathroom necessity, and there are lots of clever ways to provide towel storage in the bathroom. You might hang a towel rod on the wall, or you could lean a ladder against the wall and use the rungs for hanging towels in the space. Another way you might store towels or other bathroom items is through a storage tower, a tall, skinny tower with compartments that help add visual interest to your bathroom. Fill the cubbies with clean, folded towels that are ready to use and easy to access for you and guests. Say you have a pedestal sink in a small bathroom. While it looks great and makes the space feel larger, it also prevents you from keeping toiletries and items you need every day close at hand. Here’s what to do: Enclose the area beneath your sink with a sink skirt, made in an attractive fabric pattern or color that works with your design sensibilities. Then, beneath the skirt, you can keep bins, containers or whatever you like — without making your overall space feel cluttered. The more you discover about bathroom storage possibilities, the more you realize that there’s extra room in those slim spaces than you might think. Whether you’re trying to make the most of a small main bath or just to be strategic about storage in a powder room at home, the four ideas above are a great place to start. By working with what you have and creating storage to suit your space, you can turn your average bathroom into a more useful room. 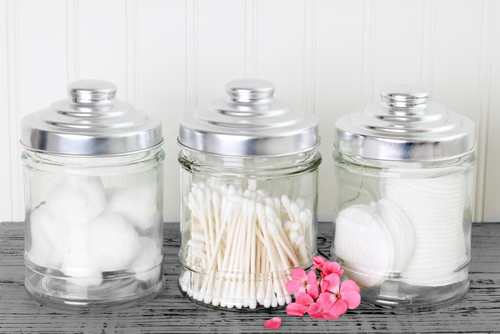 Are you interested in exploring storage solutions that might work in your bathroom? Come to Modern Bathroom! As the best online resource for factory-direct pricing and free shipping on bathroom goods, we’re the place to go for all kinds of bathroom products. Head to our storage page to learn more about our linen towers, side cabinets, shelves and more! When you buy with us, you can rest easy that you’re getting a great price. Whether you opt for a shelving unit or a wall cabinet, after you’ve bought it, we’ll refund 110 percent of the difference if you find a lower price elsewhere within 30 days. Stop by any of our Southern California showrooms to explore products in person, or contact us today to talk about the possibilities! When it comes to a beautiful, functional bathroom, there’s a lot more to the space than mere components like a vanity, a bathtub and a toilet. In fact, an increasing number of bathroom designs are strategically incorporating bathroom furniture, as well as appliances, to maximize comfort and convenience in daily routines. What kinds of bathroom furniture pieces are popular today? How might you use furniture like stools or cabinets to dress up and add style to your bath? To help answer these questions, here’s a look at 10 of the most popular and innovative bathroom furniture pieces being used today! Explore these possibilities to get inspired with ideas for your own bath. A metal stool. A short, minimal, metal stool can serve a range of purposes in the bathroom — a place to display trinkets, a booster for kids to reach the sink, a place to sit while you’re applying makeup or organizing a vanity drawer. Today’s bathroom products market includes all kinds of metal stools that are portable, lightweight and stylish in the bath. A shower seat. Enjoy a little extra luxury and convenience in daily showers when you add an attractive, modern shower seat to your bathroom. For the best benefits, look for an option with a water-resistant seat and durable construction. There are even models that can be mounted to the wall and folded up or down to accommodate use. A sleek and modern stool. For one more seating option, explore the possibilities of attractive, high-end bathroom stools. Featuring slim profiles and lightweight designs, these stools can have waterproof tops that make them usable in the shower as well as attractive designs that make them decorative benefits in the bathroom. An angular table. For the kind of extra storage space that can bring a few toiletries right next to you in the tub or nearby at the vanity, look for a simple, angular table that’s mobile and versatile. There are endless ways to use this piece of furniture, from holding lit candles while you bathe to keeping relevant products near you while you get dressed in the morning. Flexible and movable, a small side table can add wonderful convenience to the bathroom. A wall-mounted linen cabinet. Gone are the days when vanities and storage costs are the only options for bathroom storage. In today’s market, you can find linen cabinets that mount to the mall and provide shelving and storage for linens, toiletries and more. A bonus feature is a door mirror that provides you with extra visibility in your daily grooming routine. An extra storage niche. Whether you’re talking about a small side table or a free-standing niche, there are all kinds of storage options that can expand space in the bathroom today. In a bathroom where there’s enough space, add one of these furniture pieces to display towels, toiletries or whatever you like. Wall shelves. The same idea behind open kitchen shelving extends into the bathroom with wall shelves that showcase attractive bathroom products for added style. You might house matching containers filled with beauty supplies or small vases holding bathroom-friendly plants. Whatever the case, wall shelves give you a way to add more personality to your bathroom space. Rolling carts. Storage can always be within reach when you utilize something like a rolling cart in your bathroom space. Whether you use it to hold toiletries, towels, reading materials or bath products, a rolling cart makes storage portable and reachable wherever you are. A bathtub headrest. There’s no piece of furniture that so contributes to a spa-like feel in the tub like an adjustable bathtub headrest. Designed to affix to the bathtub with suction cups, a headrest allows for easy reclining in the tub. While supporting your neck and head, it lets you lean back and relax in a long and comfortable soak. Room dividers. Say you want to add a little privacy in a large bathroom, accommodating a dressing area or separating a less-attractive part of the room from the rest. Room dividers offer a smart solution, especially now that there are models with accessories like towel holders or mirrors available, already integrated in the designs. Bottom line with bathroom furniture? Knowing what’s best for your bathroom is all about knowing what’s best for your needs. Think of how you do or could use your bathroom and look for furniture pieces that can better accommodate your uses. Would you like more storage space? Could you enjoy a place to sit while you get ready or a way to sit in the shower? In many cases, there are already furniture solutions available to address these desires. Explore our website to shop Modern Bathroom’s thousands of products, all available at factory-direct pricing that can save you up to 70 percent of retail costs! We offer free shipping and a low-price guarantee, so if you find the same product elsewhere for a lower rate, including shipping, within 30 days of your purchase, we’ll refund 110 percent of the difference. Shop our site today to learn more!